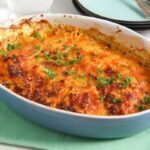 A very easy to make sweet potato gratin with Parmesan and lots of spices, a comforting side dish or light main meal for any time of the year. I adore sweet potatoes! Honestly, they are for me one of the most comforting vegetables out there, so soft and tender, sweet and delicious! And comforting is kind of strange to say for me in this case, because actually I always connect the words comfort food with childhood food, something that my grandmother used to cook, something that brings back good memories and so on. And I can hardly say that about sweet potatoes. I have never even heard of sweet potatoes during my childhood and youth in Romania and I must have been in my late 20’s the first time I have ever had them, a long time ago while we were living in London. I had never seen them before London either, not even in Germany, they were really not to find around here 10 years ago. Things have changed, thank God! Now you can find sweet potatoes just about anywhere, even in our rural region in Germany. And I buy and eat them a lot! I have at least one large sweet potato in the house at most times and I usually just roast it together with regular potato wedges as a side dish for chicken or fish. My kids hate sweet potatoes, I really don’t understand why, they love anything with a sweet touch otherwise, and my husband prefers his regular potatoes as well, so it is mostly me who gets to enjoy that solitary sweet potato on the large baking tray full of the regular sort. This time I have tried something different with sweet potatoes. 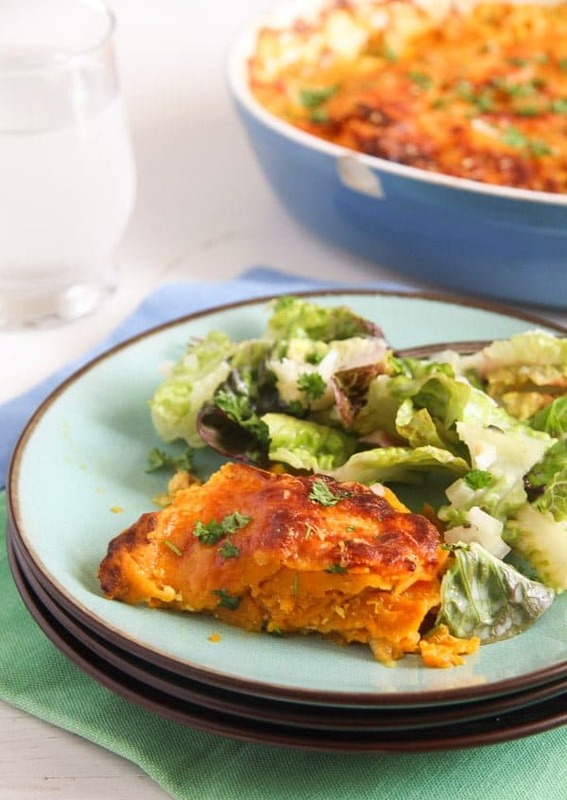 This flavorful Easy Sweet Potato Gratin with Parmesan, layers of meltingly soft sweet potatoes, spiced with lots of spices like cinnamon, cumin and turmeric, a garlicky and cheesy gratin perfectly suited as a side dish for chicken or fish. And not only a side dish. I reheated the leftovers the next day, made a crisp green salad with yogurt dressing and I couldn’t have been happier. A satisfying, light and super healthy lunch! I used a mixture of milk and cream for the Easy Sweet Potato Gratin with Parmesan. I know many people who only use cream for making a potato gratin or dauphinoise, but to tell you the truth, although I love those creamy gratins, I am usually not so keen on eating so much cream (unless is whipped and on a cake… 🙂 ). 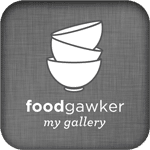 I know other people who only use milk for their gratins and I have tried that myself a couple of times. It is not that I did not like the result, but still I prefer the creamier result given by the combination of milk and cream. And the Parmesan is a must! Choose a vegetarian hard cheese if you like to keep this dish vegetarian, but don’t leave it out, it was so good, it added just that amount of cheesiness and goodness those sweet potatoes needed. , it makes the job much better and faster than you could possibly do it yourself. I have tried many times (before buying a good mandoline) to cut potatoes thinly, but it never really worked out. How to season sweet potatoes? I used a mixture of cinnamon, turmeric, cumin, cayenne pepper and garlic to spice the Easy Sweet Potato Gratin with Parmesan, in my eyes a rather Middle East-inspired spice mixture. It was absolutely amazing, I especially love to combine sweet potatoes with cinnamon. 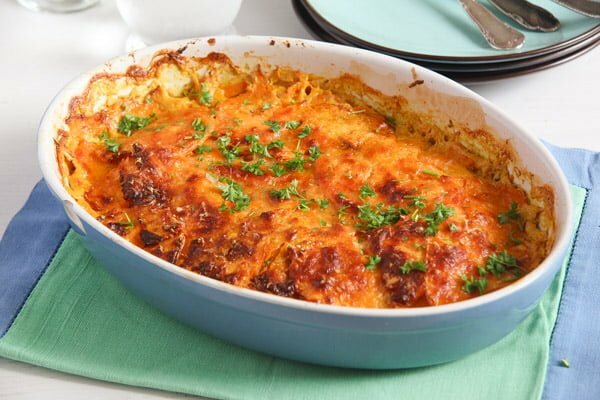 But this spice mixture is really optional, you can spice the sweet potato gratin with any kind of spices you like, something to better fit your personal taste or something to fit the main dish you’re serving this gratin with. Salt and pepper would be quite enough as well, if you like to keep it simple, sweet potatoes have enough taste on their own. Otherwise I sometimes like to spice up sweet potatoes with paprika, either sweet, hot or smoked, dried herbs like thyme, savory or oregano, even herb mixtures like Herbs de Provence or Italian Herbs. Just follow your inclination, I think you can hardly go wrong here. And here are some other spice/herbs combinations I have tried with sweet potatoes over the years, not necessarily when cooking sweet potatoes gratin, but also when roasting sweet potato wedges or fries, when making soup or a sweet potato chili or stew. 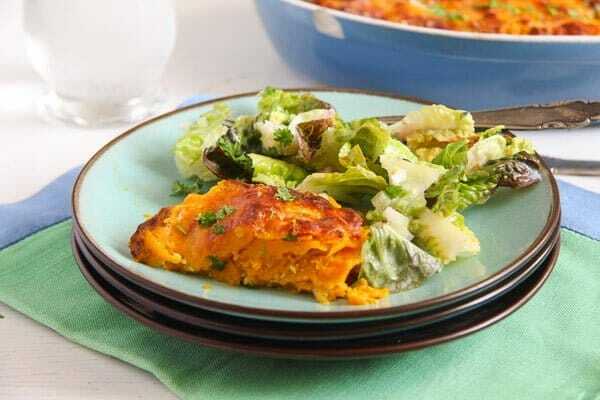 This recipe for Easy Sweet Potato Gratin with Parmesan serves two as a main dish with salad or four as a side dish. 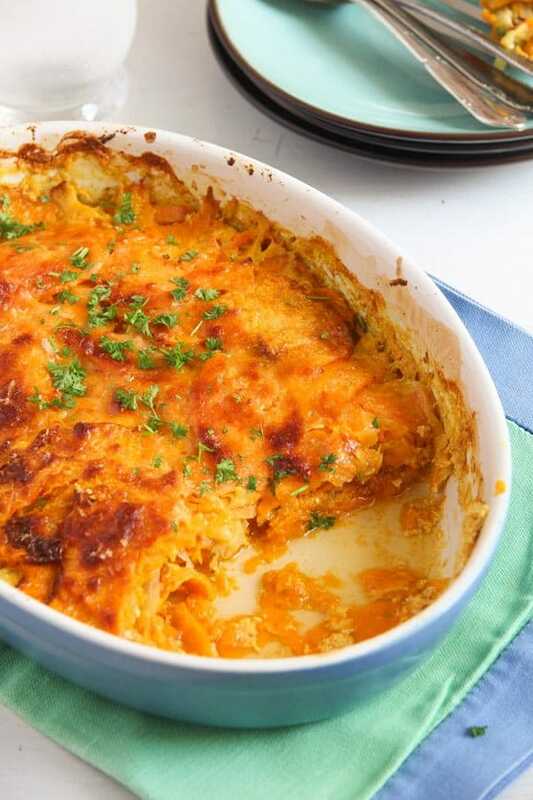 The sweet potato gratin is at its best when served immediately, but it can be reheated in the oven as well.
. Give them to a bowl. Mix together the cinnamon, cumin, cayenne pepper, turmeric, grated garlic and olive oil. Rub the sweet potato slices with this mixture. Mix together the milk and the cream, add a little salt to the mixture. Butter a casserole dish. Give about 1/3 of the milk-cream mixture to the dish. Arrange half of the potato slices in the dish. Sprinkle them with half of the grated Parmesan. Add another 1/3 of the milk-cream mixture and arrange the remaining sweet potato slices on top. Pour in the remaining milk-cream mixture. Push the potatoes a little bit down to make sure that they are surrounded by the liquid. Sprinkle with the remaining Parmesan. 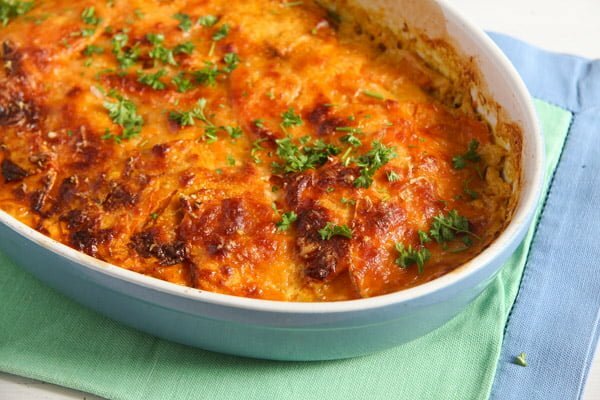 Bake the gratin for about 40-50 minutes or until the sweet potatoes are soft. If the gratin gets too brown too soon, cover it loosely with aluminum foil. Let the gratin rest for 5-10 minutes before serving. I love the natural sweetness of sweet potato and then the savory cheese…perfect combo! All hail the sweet potato. I did not know that they were not readily available in Europe until recently. 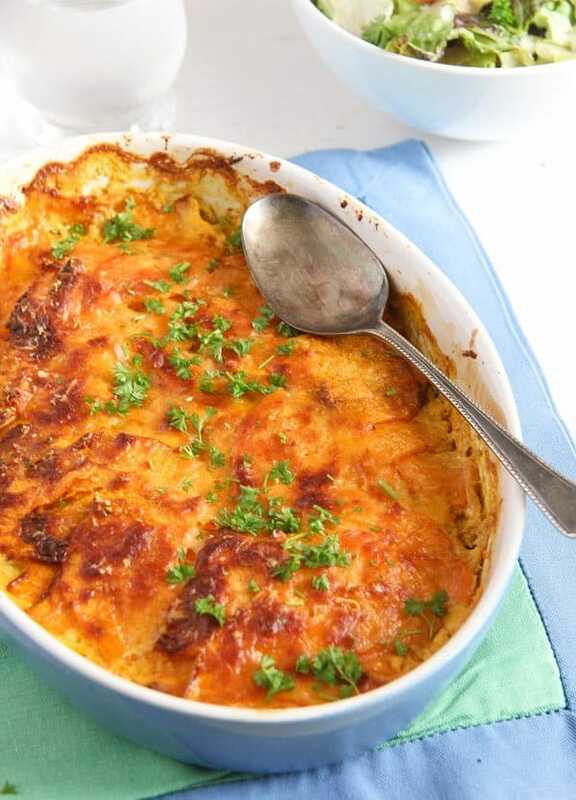 The gratin looks amazing and I love how you added a little turmeric to the spices. A great dish! YUMMMY!!! 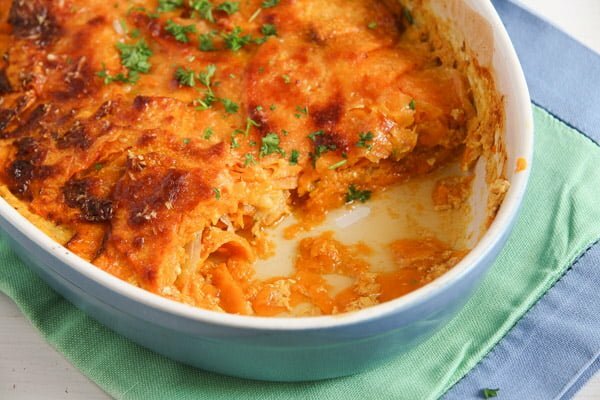 Fabulous idea to use sweet potatoes in a gratin. It looks fabulous and I love your seasoning.